About Coral Reefs/Comparing Oceans - Compare the tropical waters of the Caribbean Sea to the temperate ocean off the coast of Maine. CoRIS - About Coral Reefs - This site discusses some of the most important aspects of coral reefs. Many of their physical and biological characteristics are discussed in detail. Coral reef threats, both natural and human-induced, also are explored. Coral Reef Alliance - Check out their great photobank. 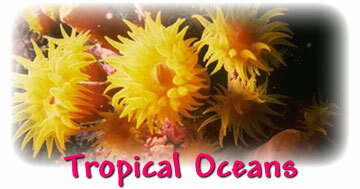 Reef Life - This site contains great photos and information about a lot of different reef animals. Reef Education Network - This is a fun and interactive way to learn about coral reefs and the creatures that live in, on, and around them. Dive and Discover - Join six different expeditions of discovery and exploration of the deep seafloor in this interactive website. Monsters of the Deep - Dive to the deepest reaches of the world's oceans, and discover the bizarre, alien creatures who live in these dark and strange places. Hawaii - Coral Reef Network - This site presents information about Hawaii's coral reefs and marine life.